There are very few things in this world better than Birthday Cake. Except maybe a rainbow ice cream birthday cake. So we made one and hope you will too. It’s great for a crowd, gluten and dairy free and it’ll serve about 18 of your favorite people! 1 ½ pint each of 6 SorBabes Flavors: Cocoa Haze, Café Almond, Pistachio & Caramel, Raz n’ Berry, Passionilla and Jam n’ Lemon. In a food processor, grind up the Brownies until you have a fine crumb. Press the crumbs into the pan creating an even layer on the bottom. Working with 1 flavor at a time, temper 2 pints of SorBabes until just soft enough to scoop and spread easily. Starting with Cocoa Haze, fill the springform pan with 1 ½ pint of SorBabes and spread into an even layer *using an off-set spatula. Freeze for 30 minutes before adding the next layer. Continue with the next layer of Café Almond, then Pistachio & Caramel, Raz N’ Berry, Passionilla and finish with Jam N’ Lemon using it to “frost” the top. Feel free to do some fun swooshes here with the offset. 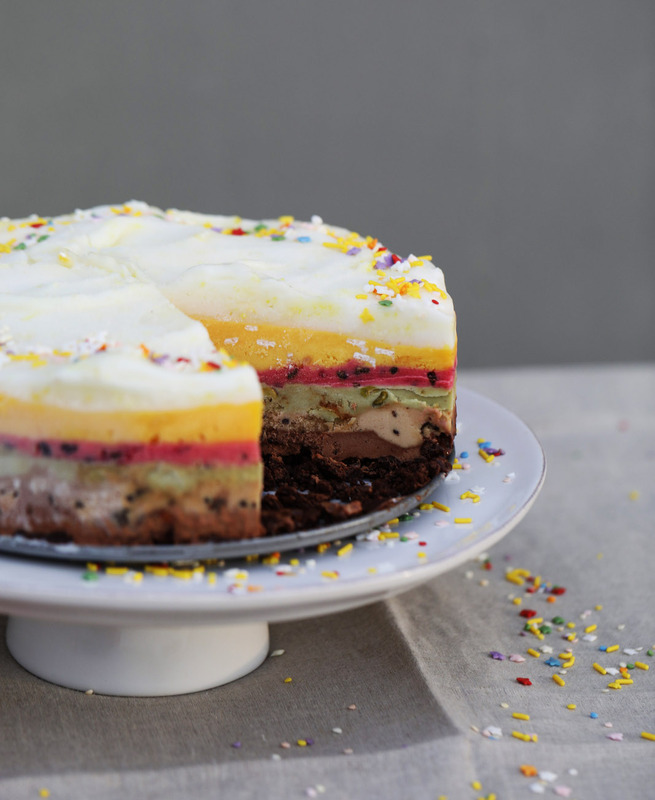 *Be sure to freeze the cake for 30 minutes between adding layers so they don’t melt into each other. Freeze overnight. To unmold run the sides of the pan under warm warm to release. Take off the outer ring to reveal 6 beautiful layers. Decorate with Natural Sprinkles. To slice, allow to sit a room temp for about 5 to 10 minutes. Run a knife under hot water to slice.